National Association of Professional Geriatric Care Managers survey of aging experts says that the most important thing you can do is to give all family members a chance to voice their concerns, questions and ideas. "It is really important to keep the lines of communication open," said NAPGCM President Julie Gray. 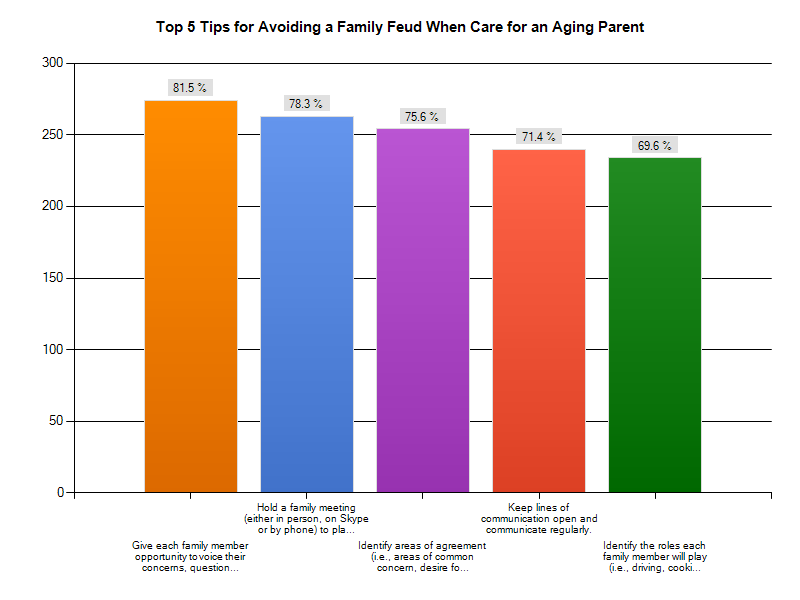 Looking for tips on how to avoid a major family feud when dealing with the sensitive issue of caring for your aging parent? Today the National Association of Professional Geriatric Care Managers (NAPGCM) released the results of a survey of 335 geriatric care managers across the country on this question. 1. Give each family member opportunity to voice their concerns, questions and ideas. (81.5%). 2. Hold a family meeting (either in person, on Skype or by phone) to plan for emergencies or the future. Using an objective facilitator can be helpful. (78.3%). 3. Identify areas of agreement (i.e. areas of common concerns, desire for parent to age in place, safety) and disagreement (i.e., need for caregivers, who will be the caregivers, staying at home or moving to a care facility) among family members. (75.6%). 4. Keep lines of communication open. (71.4%). 5. Identify the roles each family member will play (i.e., driving, cooking, live-in, financial support, spokesperson, errands, housecleaning, gardening, outings, etc.). (69.6%). NAPGCM conducted the survey of their members from May 16-20, 2013 as part of National Geriatric Care Manager Month – an effort designed to educate the public about the issues facing older adults and the role of caregivers in supporting them. “Geriatric Care Managers work with older adults and their families on a daily basis. A top issue we see is family tensions that develop, and then intensify, when there is a lack open and regular communication within the family,” said NAPGCM President Jullie Gray. ”It is really important to keep the lines of communication open – when it stops many problems develop for aging family members and those they love”, she added. “It is also very helpful for adult children to establish clear division of responsibilities – Who is going to take Mom to the doctor? When will we visit her? Who can regularly buy food? Or should we rotate that responsibility? – for all the areas an aging family member will need support”, Ms. Gray also said. The National Association of Professional Geriatric Care Managers (NAPGCM) was formed in 1985 to advance dignified care for older adults and their families. Geriatric Care Managers are professionals who have extensive training and experience working with older people, people with disabilities and families who need assistance with caregiving issues. They assist older adults who wish to remain in their homes, or can help families in the search for a suitable nursing home placement or extended care if the need occurs. The practice of geriatric care management and the role of care providers have captured a national spotlight, as generations of Baby Boomers age in the United States and abroad. For more information please visit http://www.caremanager.org.